"PGS has provided our daughter with a set of musically talented peers and the framework for learning songs together and preparing for a high stakes gig." "Our kids have been studying under Cole for two years now and I've been nothing up amazed the entire process. " Cole Robinson accompanies on drums. Joining up with a band not only motivated him to practice, but working with other musicians also made the whole thing click for him. His improvement since working with Cole has been amazing." "Cole is both knowledgeable and patient, and for my son, hit that sweet spot where music is challenging yet still fun and interesting to learn." "PGS, helped me connect with music in a whole new way. The ensemble class was a true eye-opener." 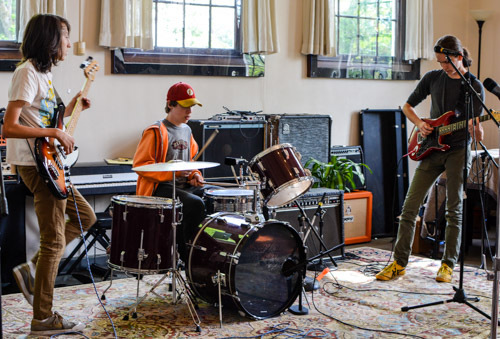 "A fantastic model for a music program and the only one like it in Portland." Pacific Guitar Studio is a locally-owned music school focusing on musicianship, mentorship, & creativity. It was created by northwest musician, Cole Robinson, to provide students with inspiring community-minded music education. For a over decade, Cole Robinson has been dedicated to music education, community development, and youth mentorship. As an educator Cole has taught, designed, and supervised unique and highly acclaimed curriculum in music education, outdoor leadership, and youth empowerment. Cole holds Bachelors of Arts Degrees in both International Studies and Music and has studied with world-class musicians Alan Jones, Darrell Grant, and Damien Erskine. Cole has had the pleasure of working with such great youth and environmentally focused organizations as Culture Jam!, Portland Parks & Recreation, the PSU & U of O Outdoor Programs, All Souls Community Center in New Orleans, and The International School in Switzerland. As a performer, Cole has worked with many great artists including The Essentials, Darrell Grant, Fritzwa, and Grammy award winner Lady Rizo. Raised in the Pacific Northwest, Cole is also an obsessed surfer and snowboarder. Read Cole's Complete Bio Here.